This is a vQmod which adds a new option type called "Custom Input" to your OpenCart store. On the surface, Custom Input appears just like a text input field in the front end. However, in the back end you can use the customer input to modify things about a product in a similar way as a select type option. You can modify the product weight, length, width, height, price and points based on addition (+), subtraction (-), multiplication (*), or equal to (=) and there is an extra field for performing a calculation based on user input. Additionally, you can create validation rules about what is expected & accepted as user input. You can specify a default value, as well as minimum, maximum & increment rules. 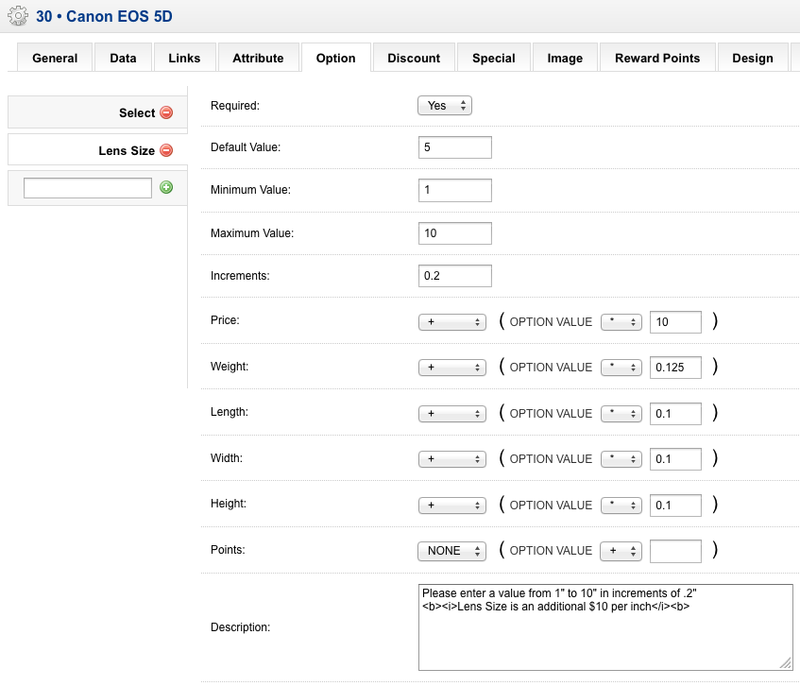 There is also a Description field for displaying a block of text below the option on the product page. This opens up a world of possibilities for creating custom options and you will find this a useful companion to any shipping modules which use product dimensions to get rate quotes, such as Qphoria's UPS Deluxe addon. As of 3/24/2014 this is also compatible with Qphoria’s “Option Price Update Redux” extension for live updating of price. * PLEASE MAKE SURE TO CLEAR YOUR VQMOD CACHE WHEN INSTALLING TOGETHER WITH PRICE UPDATE REDUX. If you like this extension you also may be interested in Options Modify Dimensions which allows you to modify a product's dimensions with standard select, radio, and image options. v1.4 • 6/23/2014 Fixed a bug that caused errors when saving products with no options in admin panel. v1.3 • 4/28/2014 Improved compatibility with Options Modify Product Dimensions and some custom themes. v1.1 • 3/11/2014 Fixed a bug in option rows when adding multiple instances to a new product.